This property is directly associated with the initial period (1902-1920) of downtown commercial expansion that occurred due to local economic prosperity after the Klondike Gold Rush and in tandem with explosive population growth and suburban neighborhood development. During this era, modern downtown urban scale began with the construction of the earliest steel-frame highrise buildings and the establishment of a concentration of banking enterprises and department stores along Second Avenue from Cherry Street to Pike Street. The initial regrading of Denny Hill and the commercial redevelopment of the former University Grounds (University/Metropolitan Tract) were major factors that facilitated northward and eastward commercial expansion. In 1914, the owners of the Frederick and Nelson Department Store purchased property with the intention of building a large, five-story store at Fifth Avenue and Pine Street, thus solidifying the location of the future downtown retail core. A significant number of extant commercial properties dating from this era remain within the downtown commercial core, including: numerous hotels, banks, business blocks and early highrise commercial buildings, as well as some specialty and department stores, clubhouses, apartment houses and theaters. After the turn of the century, local and regional economic prosperity generated the earliest construction of tall, steel-frame and ferroconcrete office buildings at the northern edge of the commercial district along Second Avenue. The 14-story Alaska Building (1903-04), the 12-story American Savings Bank/Empire Building (1904-06, destroyed), and the not fully realized 12-story Mehlorn Building (1906-07) were constructed exhibiting elegant brick and terra cotta cladding and ornament in a design mode heavily influenced by eastern precedents, especially the Chicago School. As compared with typical masonry-bearing wall construction, steel-frame construction allowed for both greater height and greater flexibility in office layout. Thus, these modern buildings could accommodate a wider variety and number of tenants. Distinctive early skyscrapers of similar scale, construction technology and design character – as well as more modest commercial blocks - would be constructed elsewhere in the expanding commercial core over the subsequent ten years, including: the Eitel Building (1906); Northern Bank and Trust Company Building (1906-09); the Central Building (1907); the White Building (1908, destroyed), the Henry Building (1909, destroyed), Cobb Building (1909); and the eighteen-story Hoge Building (1911) and at the far north end of the expanding commercial district the Securities Building (1913). Along with the Northern Bank & Trust Company Building (1906) and the Eitel Building (1906), this building is among the earliest commercial highrise office buildings to be constructed at the north end of the expanding commercial and retail district. It is believed to have been designed and built for Seattle attorney James Haight, who purchased the property in January 1908. Construction cost was reported to be $150,000. After Haight’s death in 1946, the building was purchased by the 2nd and Pine Corporation for $200,000. It was renovated in 1991. The architect for the Haight Building is reported to be Stephen A. Jennings; however, no biographical information has been gathered about him and virtually nothing is known about his career in Seattle or elsewhere. He was listed as an architect in the Polk Directory from 1899 to 1907 and is known to have designed a residence on Queen Anne Hill in 1907. This is a relatively intact, although modest in terms of architectural design, example of an important early downtown commercial property type. However, this property was recently determined to be eligible for listing in the National Register and may potentially meet local landmark criteria. 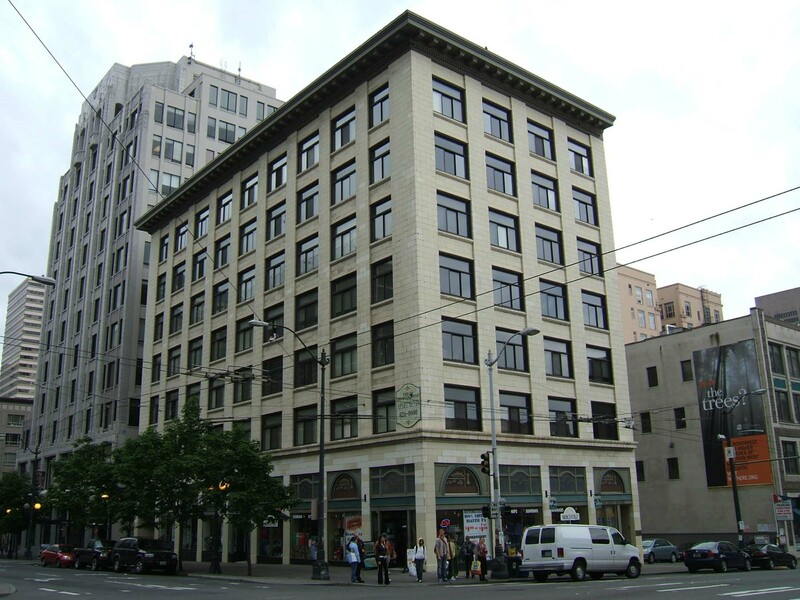 Located at the SE corner of Second Avenue and Pike Street, this seven-story fomer office building now includes apartment units and several retail stores. It measures 53’ x 108’ and originally included approximately 109 individual professional office spaces. It exhibits a simple two-part vertical block façade composition divided by nine bays at Pine Street and four bays at Second Avenue. The reinforced concrete structural system includes a concrete foundation and basement. It is clad with a smooth greenish-cream color stone that has been painted. Exterior architectural features are limited to a prominent sheet metal cornice with dentil course and entablature ornament. The shaft is dominated by smoothly clad piers and spandrels and large window openings. The original Chicago-style windows included a fixed lower panel and hopper type upper panel. They have been replaced by a modern aluminum product with additional mullions. The base/storefront level is distinguished by prominent intermediate stone cornice and original mezzanine level windows that include an Art Nouveau-inspired arched window/glazing configuration. Several of these windows appear to remain in place along with several original display windows with fixed copper sash members and low bulkheads. Some other display windows now have modern aluminum sash members. In addition to extensive upper floor level windows alteration and storefront bays that have been modernized, a modern entry vestibule has been added at the Pine Street elevation. There do not appear to be any intact or architecturally significant interior building features, finishes or public spaces. "Mushroom Growth of New Buildings" Seattle P.I., August 29, 1909.